SE-28-39-2W3 for the school location directly east of my Dad’s farm which was the S-29-39-2W3. Hello. 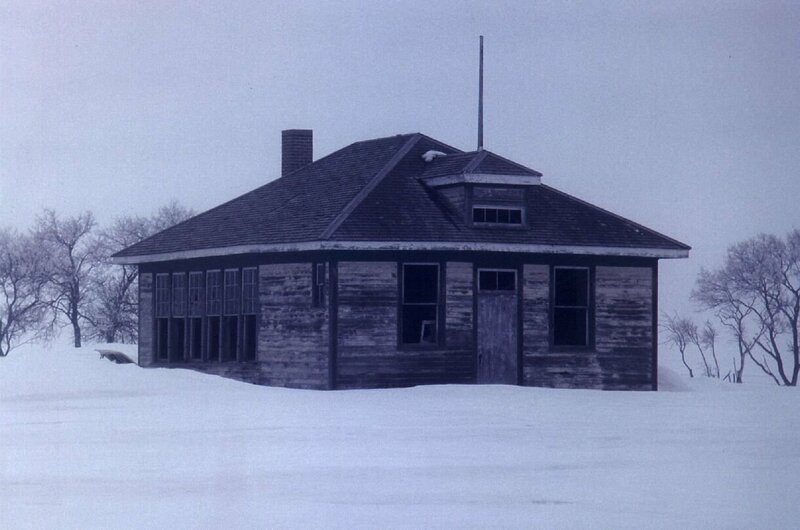 I took a photo of the old Corn Valley single room school in the 1980’s shortly before it was torn down. I have attached a scan. I hope you can use this on your great website. Thanks. An addendum sent in by Gordon Thompson follows from the supplement to the Aberdeen local history book; Aberdeen, 1907-1981 ISBN: 0889253757 Publisher, Date: Aberdeen, Sask. : Aberdeen Historical Society, 1982. "My first teacher was Mr Schellenburg as mentioned in the write-up. Mr Willms came after him. The write-up covers so many of my memories as well. The teachers house was also on the yard as well as the barn. Mrs Willms memories in her book covers a portion of the challenges of country school teachers houses (I believe she mentioned Corn Valley) . Frank Taylor was my fathers teacher and left a very positive last impression on him. He lied about his age and joined the Canadian Army when he was 15 and served overseas in WWI. He was gassed and always had a persistent cough all his life. He became a teacher after the war. When he passed there was no funeral and his body was donated to science. When you entered the front door, the boy’s cloakroom was on the right, girls on the left. The rows of desks were set by grades with the Grade 1 at the very front on the first isle on the right as you entered the classroom. Once school commenced we all sang O Canada. I recall some exercises by our desks (singing Head, shoulders, knees and toes). At lunch we would all go out into the yard and eat there (except when raining or in the winter). No one was allowed back into the school until lunch was over. The end of the day we sang God Save the Queen. Interestingly, the only flag I saw ever flown at this school was the Union Jack. "